From Then to Zen – A journey of self-discovery. Where have I been? Oh…everywhere and nowhere. I moved across the country and restarted my life. Of all of the crazy adventures that I have been on, this has certainly been the craziest. I chose a new career path and lived in a pop-up camper for five months. You know that quote, “If you don’t like where you are then move, you aren’t a tree.”? While I certainly felt like a tree, I was determined to pull my roots and move. It has been terrifying, as most rewarding things are. I planned on working freelance and privatized my page just in case I double entered a piece. Screw that. I would rather type endlessly to you all about my journey than pursue a career in writing. Why? I could reach a lot more people if my writing was more recognized. The reason is that “one”. The one person who reads an article and finds the words that they needed on that day. The one person who feels a little less lonely in the world by finding common ground with a stranger’s ramblings. The one person who was afraid to take a leap, but decided if I could then they could. There are days when my page isn’t viewed at all and there are days when I have a few bites. I could care less about the numbers. It is all about one. I value every person as their own entity and reaching one person is just as valuable as being recognized by the collective. So, here we go. New topics. New questions. A new journey. It is typical, during a time of great fear or tyranny, that the arts get neglected. Survival takes precedence and creativity is squandered. The arts provide an immeasurable amount of avenues for releasing negative feelings like fear, doubt, sadness, grief, and silence. It is something that we take for granted; those of us who feel free and safe enough to immerse ourselves in it. There is a lot of uncertainty surrounding politics today, and bringing up North Korea typically strikes a negative chord. It can illicit fear and anger almost immediately. While it is a serious situation, I want to shift the attention away from the leaders to the citizens. Think about their lifestyle and what fear they must experience every day. Now, think about their lack of artwork. Photos of North Korea highlight breathtaking views of beautiful scenery, but lack color within everyday life. There is no art. There is no expression. Anything that is created is done so for one purpose: to glorify their leader. That does not mean they do so willingly and that is their art. Their devotion is typically not by choice, and their art (or lack-thereof) illustrates that. There is no freedom to think critically or to express themselves. What would it look like for children to fulfill their dreams of taking dance classes or learning to play instruments? Someone might paint a canvas of the sky above their new home or a mural of their indescribable journey. Feet that have never danced would carry someone away from their fears. Voices that were silent would suddenly be heard. Hands that served would finally create. Generations of emotion would come pouring from them as they describe their ordeal in a language that the entire world could understand: art. It is easy for them to fade from our memory altogether as we go about our daily lives; standing next to art that we barely notice is hanging there anymore. Let us be compassionate and empathetic to the people there who are just like us, but who are yearning to be free. Let’s remember the spirit inside of them that they may have forgotten. One day, they will need us to watch and listen as they are liberated through creation. When that day comes, we will see some of the most powerful art that we have seen throughout history. There is a weakening of our spiritual selves when we are disconnected from others who share a similar journey or the paths that we are on. I learned this the difficult way. Seven years ago, I moved from a very diverse area to an area that is the exact opposite. It was like taking a free bird from the sky and caging her. Instead of growing and exploring, I retreated. My differences made me feel isolated, so I ignored them-pushing them far back into myself until they were barely detectable. Recently, I have become more open and honest about myself in hopes of growing in authenticity and spirit. It didn’t take long before I began to blossom. That is not to say that I have blossomed fully; I am somewhere in the middle. My current state is equal to a rose that has just began to bloom. You can see the color through the closed leaves, but the bud has not yet fully opened. Instead of feeling isolated in my journey, I have found women online who share my interests and are on similar paths. Technology can bring so much negativity into our lives, especially social media. I made it my mission to fill my news feeds with positivity. For every negative article I encounter, I seek out a positive one. For every media page that I follow, I follow two pages that promote positivity and peace. Since doing this, I have restored balance and am able to stay current on events without losing myself to them. This is a practice that took months to adapt to. A wise woman responded to me this morning with one of the most helpful things that I have heard lately. I introduced myself into a new group of Wild Women and stated that I currently don’t have a tribe, due to my area being very conservative and it being difficult to find like-minded people here to share my journey and experiences with. She said, “Welcome. The world is your tribe!” How beautiful and true. Instead of feeling isolated, she allowed me to feel open to the possibilities of connection beyond my physical existence. I realized how thankful I am for technology and the connection that it can provide, if we use it wisely. I encourgae you to restore balance and peace within your life by incorporating more “good news” and positive influence into your screen time. Watch inspiring videos, listen to music that moves you, follow pages such as “Good News Network”, learn from people, and connect. Your body and mind will thank you. I recommended someone earth today and said that I was going to as well. It is very cold and cloudy out today (even though it was around 80 yesterday?) but I decided to do it anyway. For those who aren’t familiar, “earthing” or “grounding” is when you receive the Earth’s minerals and energy through connecting with the dirt. I have felt so drained lately. I am an empath and am greatly affected by others’ suffering. Current events had me feeling disheartened, my health has been poor for the past few days, and I have generally felt like the life has been sucked out of me. I forced myself to go outside and connect with nature. I sat on my son’s swing set and dug my feet into the Earth. At first, the soil was wet and cold. As I dug a little deeper, it started to feel warmer. I felt the energy, and right when I thought it couldn’t feel any better, the sun broke through the clouds and beamed some rays right on my shoulders. Aside from the minerals and natural energy of the Earth, there is something so magical about being in the dirt. As I sip on my green tea and reflect on that moment, I am reminded of my childhood. I pretty much never wore shoes when I played outside as a child. My feet were constantly in contact with the Earth. We lose so much when we grow older and stop doing this. Our bodies crave the Earth’s energy. We need it to sustain us. Without it, we feel disconnected and drained. Earthing is one great way to reconnect, re-energize, and revitalize ourselves. Go outside, take off your shoes, and dig your toes into the soil. Reconnect. Breathe in the wind and soak in the sunlight. You can always wash your feet later. I’m ridiculous. I bought another Journal. I really love journaling now that I have created my little system. Well, now that has been enhanced by (drumroll) bullet journaling. I jumped on that train last night and I can’t wait to post some progress photos once it has been used longer. So far, it is right up my alley. Cheers to the guy who created that system. More on that later. It’s that time of year again! The clock changed and it didn’t take long before the memes started rolling in. People are always pretty upset around this time of year when they lose an hour of sleep. I was definitely one of those people until this year. My husband and I got out of bed Sunday morning excited. See, we had an activity that we really wanted to do outside but there wasn’t enough daylight when he got home from work. DST arrived and we got one more hour of sunlight back! The days are longer and it gets dark later, so we are able to do more together as a family and enjoy the outdoors. It’s all about perspective! When you feel groggy and irritated with the whole DST process, try to look at the silver lining. Go outside! Enjoy an extra hour of sunshine! We always say that there aren’t enough hours in the day but we have just been given an extra hour. Go spend it doing something beautiful. Enjoy it! I’ve always been interested in journaling, but not about the day’s events. That felt too mundane for me and I would almost immediately quit. As I grew older, I became very interested in positive reading and music. I wanted to compile my favorite inspirations somewhere other than my Facebook wall. I felt every bogged down by the world’s negative energy. I needed to recharge-to boost my happiness level and stay positive. 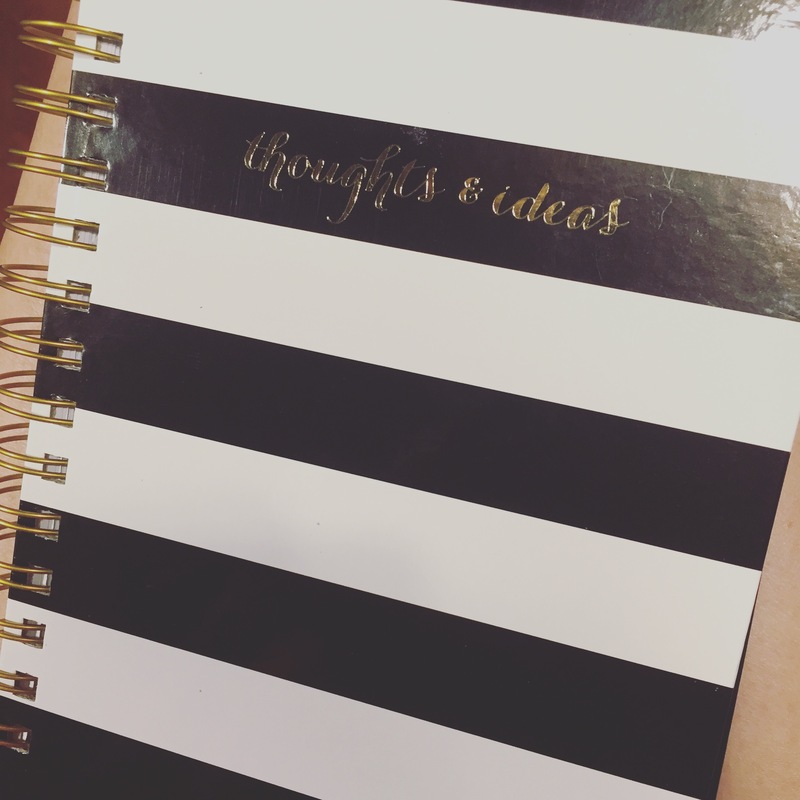 The idea struck me to start a happiness journal and it actually stuck! 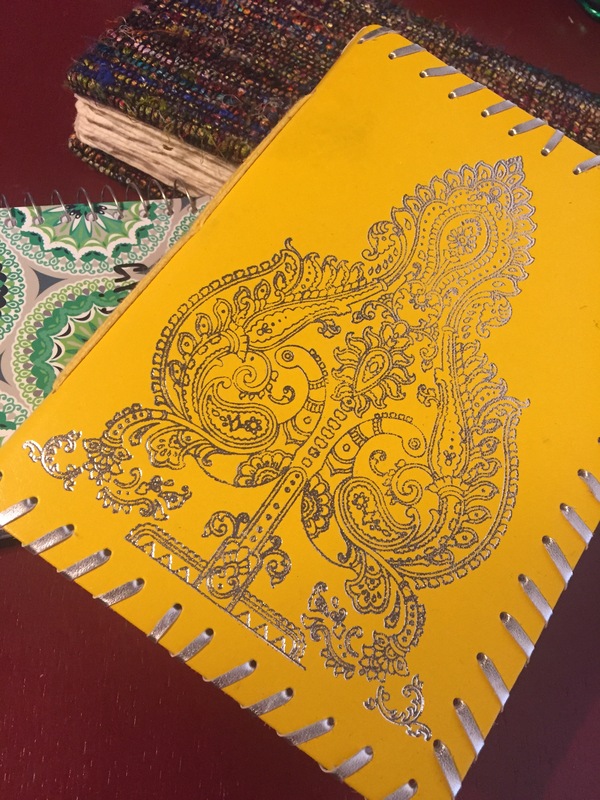 First, I purchased the handmade sari journal from a B&N in D.C. in 2014. 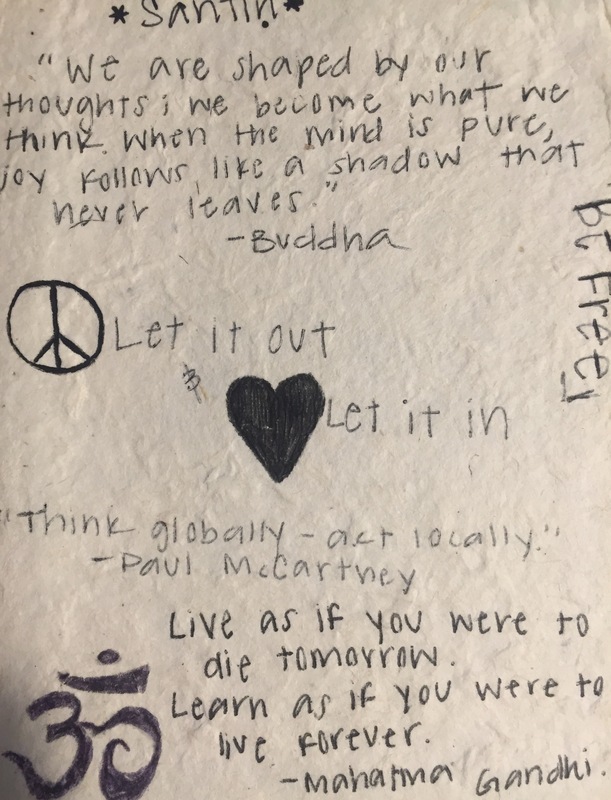 I started collecting quotes and anything that inspired me. It is a very special journal that calms and grounds me. I can’t even explain my love for this one. I even keep a bucket list in the back (it is a work-in-progress). The green notebook came next. 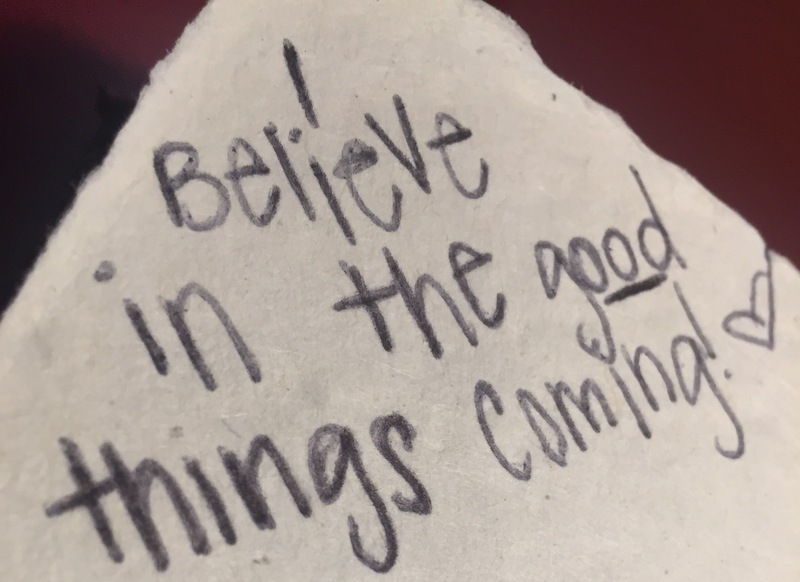 I started coming up with five things that I’m grateful for every morning. This stemmed from my efforts to make my days more positive and productive. I needed something to write them in and grabbed a cheap journal (notebook) while I was in the store. Hey, at least it’s cute and fits me perfectly! The yellow journal is one that I am very excited about. 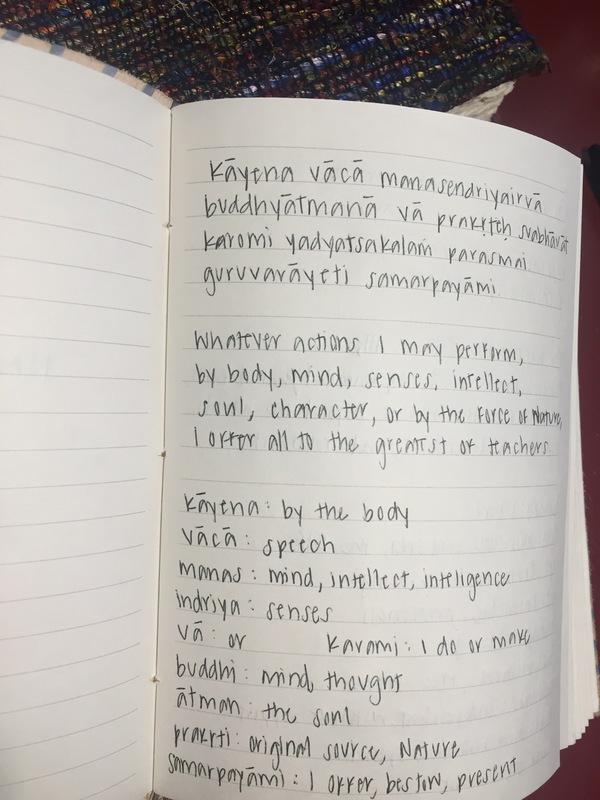 I am planning on visiting an ashram in about a month, and wanted something to take notes in. I started getting back into chanting and decided to also keep chants/verses and notes on yogic living in this journal also. This way, I always have them together and accessible. 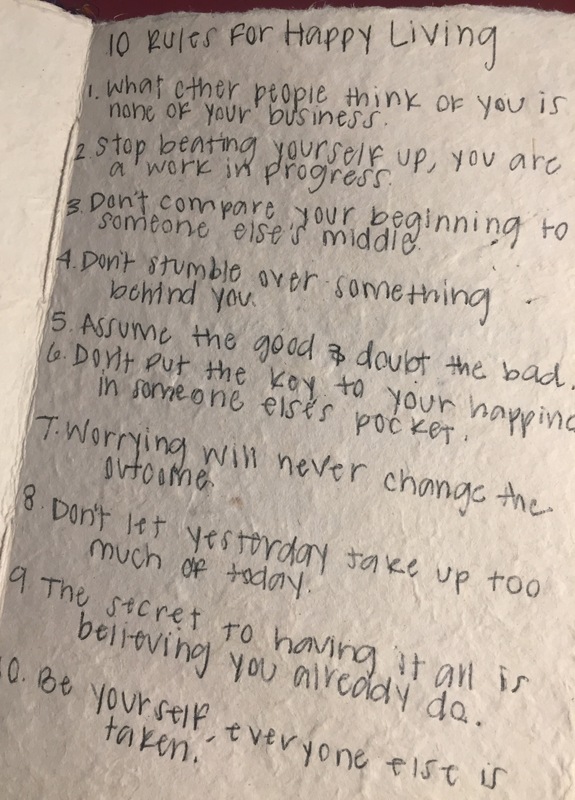 I find this type of journaling relaxing and uplifting. Most people like to read inspirational or positive quotes. Why not compile your favorites? It has been a very positive change, and I can’t wait to see how it grows and helps me to spiritually evolve. I am frustrated at being judged for not conforming to societal norms. We live in a world where children are told that they are one in a million, but then grow up and try so desperately to be like everyone else and accepted. Why is it considered taboo to be different? During the rare occasions in which it is celebrated, why is it considered trendy like we all fit into some hipster-hippie, rebellious, counter-culture stereotype? How come we can’t just celebrate the fact that we are all different, tolerate those differences, and love ourselves? I’m frustrated that I’m considered bitchy for not caring–for not being comfortable with conformity and for not caring about acceptance. Here is where that third eye comes in: by writing this, I clearly care; otherwise, I would not feel frustrated. Every single person needs acceptance. It is human nature. I have found acceptance where it matters: in the few friends and family who accept me for who I am and who respect my journey. I guess I am more frustrated that this is something that affects so many people. We are in the midst of a social and spiritual revolution. People are changing. Those of us who are awakening are being criticized and judged. All we want is what everyone else wants: to be happy. Why is it wrong that we want to achieve that happiness through living as our truest form? Food for thought. Questions without answers. The best that we can do is stay true, love, and keep evolving. Last year, I was invited to a place called Yogaville. Hidden in the mountains of Virginia, this retreat proved to be just what I needed. Not only did it provide me with a relaxing weekend, it completely changed my life. I have craved that place since I left it. The spirit, positive energy, and genuine beauty of the people and the ashram were nothing short of inspirational. Before that visit, I had never experienced chanting. I remember walking into the room terrified, because I knew that my first guided meditation session would include chanting. I survived it with little embarrassment, and found it to be very relaxing. Fast-forward to the Saturday night ceremony and I was absolutely, 100% terrified. I went from being a stay at home mom and isolated student, to sitting in a room full of strangers chanting Sanskrit. I had a choice to make: I could allow my embarrassment to ruin the experience for me, or I could dive in and and learn as much as possible. I chose the latter. I thought about our human nature and how we are so easily embarrassed-an emotion that forces us to miss out on many of life’s greatest moments. So, I chose adventure. I fumbled my way through the words and appreciated the music being played. I watched the other attendees swaying back and forth, eyes closed, lost in verse. I envied them. I wanted to feel free. Something amazing happened and halfway through the ceremony, I felt it. I felt the energy rush over me like a wave of peace. I felt connected to the words that I previously feared, and I was completely devoted to the ceremony. When it was over, I felt relaxed, collected, energized, and awake to the world around me. I wanted to stay in that world forever. Sanskrit is a beautiful language that is intimidating at first glance. Fortunately, there are many websites and videos that offer assistance with understanding and pronouncing the verses. There is something magical hidden within those words. Once you learn how and the words slide off of your tongue, you are hooked. It is also open to any religion, and is not limited to practicing Hindus. There are unrelated chants that can be used by anyone. Buddhists use chanting, and that is a philosophy that does not praise any god or idol. So, don’t feel like you are betraying your current belief system by practicing a chant. I am working on an at-home practice, and will be visiting another ashram within the next couple of months. I hope that this story brought hope to someone who has been afraid to try chanting, for fear of being embarrassed or doing it incorrectly. Free yourself. As long as you are practicing and are reciting them from a place of truth, you will feel the calming and restoring effects of the chant. Imagine you are listening to your favorite album on a record player. The music is playing as you go about your business of tidying up the house and taking care of the kids (insert personal responsibilities). All of a sudden, the record skips JUST as the needle hits the few seconds of a song that you really dislike. You try to go about your business and wait for it to continue with the great song that was playing, but it just keeps repeating the same annoying line. Each time, the lyrics jab at you harder than during the previous loop. That is the baseline of an intrusive thought. Some of us get them stronger than others, and they always vary in degree. Sometimes they are short and irritating, and sometimes they are persistent and brutal. It isn’t even confined to our own thoughts. We can have this recurring thought pattern in response to someone else’s feelings. It is very common for us to overreact to things. That is actually a simple thing to understand, we just usually don’t make the connection. By the time we lash out, we have been tortured by this thought so much, that we can’t take it anymore. We need it out and resolved. We just need it gone. The frustration bursts out of us and lands on pretty much anyone. Afterward, we get to be tortured by the thoughts resulting from our regret and self-loathing. It is a damaging cycle that is incredibly difficult to end and even harder to prevent. Conflicts that lasted for two minutes can torture the mind for hours or days. Insignificant moments to someone else, can feel significant to us because our brain locked on to it at some point and is having a difficult time letting it go. Trust me, this is far more annoying for us than those who have to witness or unwillingly participate. Those of us who recognize that the record player is broken, work very hard to make it work. We get up over and over again to reset the needle. We try humming something upbeat to distract our minds. At our weakest moments, we swear off the whole record altogether because it would be easier to not listen to it at all, than for it to periodically or semi-constantly torture us. We survive those moments and hit play for another go ’round. In the end, we can do nothing about it. Our record player is broken and it is the only one that we have. I will continue to work hard toward my peace by resetting the needle, apologizing to unwilling guests as necessary, and learning about myself in order to improve. But I know that this is me, and in order to be truly happy and at peace, I have to love myself for who I am, exactly as I am. I have to recognize that everyone has flaws and mine are no worse than someone else’s. I have to forgive myself when I screw up. I have to fight my brain every single day to make sure I am in control and thinking on the wavelength that I want. I have to see my strength and perseverance. I have to love myself and all of these things about me. That is what I’m working on every single time the record starts playing. Everyone has their issues to deal with. It is a much more enjoyable life if we learn to understand and appreciate others. It is even more wonderful if we learn to understand and appreciate ourselves. Love yourself. Be kind to one another.